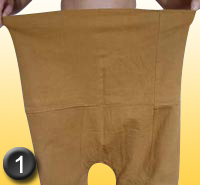 How to wear Thai Pants ? Fastening a Thai pant for the frist time can seem challenging but once you get the trick ! you'll put them on in a gif ! 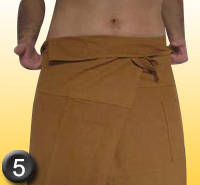 1 : Put on the pants, with the belt facing behind. 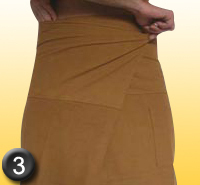 2 : Fold the pants on the side, and hold the fabric with your hand. 3 : Fold the fabric over the belly. 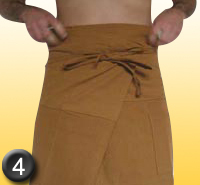 4 : Take the belt and tie them tightly at the front in order to lock the trousers in place correctly. 5 : Fold back the top of the pants. At first, putting your Thai pants correctly may seem a bit complicated so you might want to do it in front of your mirror. You will learn quickly to put on and adjust it in no time ! You will be pleasantly surprised by its quality and comfort, as well as by the freedom of movement that it allows you! Now all you have to do is choose from all the models and colors we offer!